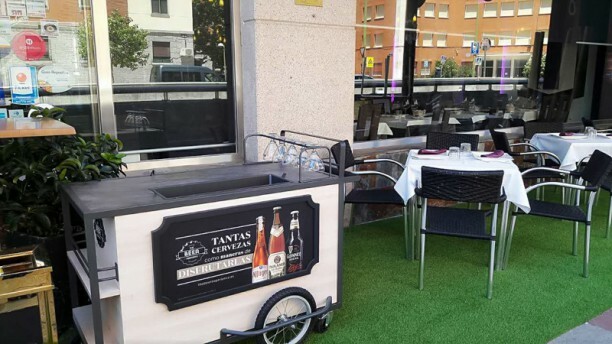 Situado muy cerca de Plaza Castilla, El Pato Laqueado es un restaurante asiático que no te dejará indiferente por la propuesta de su cocina colorista, aromática y fresca que apuesta por la calidad de sus productos. El plato estrella, es el pato laqueado, una receta que se remonta a varias generaciones. Otros de sus platos destacados son el Dim-sum (tapas chinas), las algas fritas cantonesas, de los mariscos destacan los langostinos al teppanyaki o las vieras salteadas en su concha con salsa de soja y judías negras. Con una decoración de origen oriental y un ambiente íntimo, este lugar es perfecto para pasar una agradable velada y disfrutar de un viaje gastronómico para dar placer a todos los sentidos. Nota: No se reserva mesa online para menú del día. Excellent service, very friendly staff. Good food, good ambience. For starters, they did not have the appointment on their agenda. Finally, they checked on the computer and let us to a table, but quite rudely. We had to wait A LOT for the first starter to come (with the sauce missing) and then A LOT again for the second starter (a salad). After ANOTHER WHILE, we got the duck for 2, which includes only 8 "pancakes" for the two of us, some fried vegetables with duck (which barely contains duck) and a soup (which you need to ask explicitly, they did not offer it). And the duck for two costs 30€!! The flavor and presentation was nice, but it seems too expensive (and too much time to wait). People in other tables were also complaining about how long they take for serving or attending. Besides, the check did not include the discount we had and we needed to ask for it. In summary, we will look for another place in Madrid to have Peking duck (Beijing Duck) because we are not coming back to this one. Todo excelente. Camareras muy simpaticas y atentas en todo momento. Todo muy rico y muy bien, aunque han tardado un poco. Daba la sensación que faltaba personal. I had eaten here many years ago when it first opened and you needed a reservation weeks in addvance. Not so busy now but I'm happy to report that El Pato Laqueado is still delicious and elegant. The chef uses good quality ingredients (we appreciated the quality of the scallops sauteed with fresh green asparragus, for instance), the dishes are light (not oily or fatty), and very beautifully plated. The Peking duck is moist and very flavorful and they cut it and make the pancake rolls for you tableside, which we all appreciated. We also loved the carmelized beef with carrot. With the 50% discount, this dinner for four was a real bargain! I look forward to going back soon.